This is by far my most requested recipe! Whenever there is a potluck, party, or any kind of get-together, I'm always asked, "Hey! 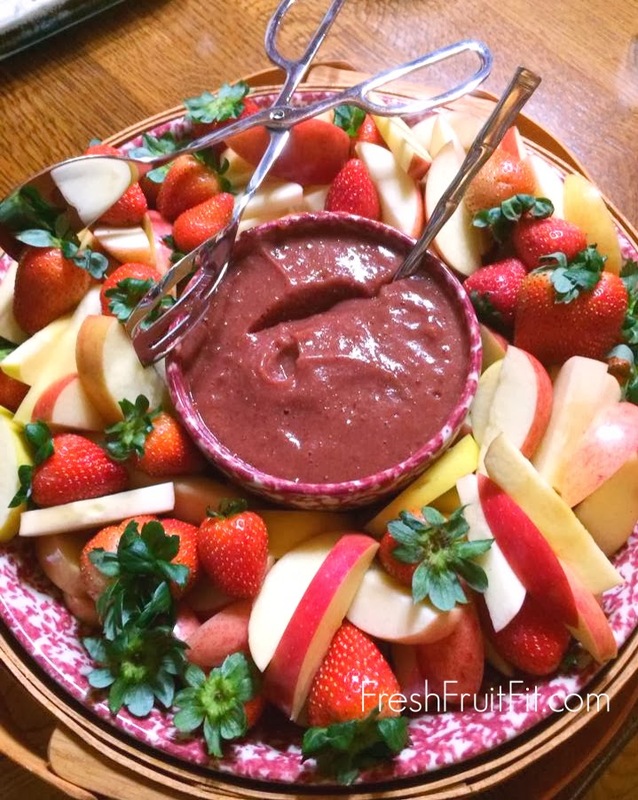 Can you bring that strawberry fruit dip? It's delicious!" Men, women, and children have all told me how delicious it is! Which makes me so happy because I LOVE sharing healthy food that makes people happy! I've seen two main reactions. After the first bite, little fireworks go off in your brain and intense happiness overwhelms you. You're then either so elated that girlish squeals are intermittently heard between "OH MY WORD!" and "This is the best stuff EVER!! ", OR as your eyes begin to light up you spontaneously slam your fist down and loudly declare that this is the best elixir to hit planet earth since ever! Now I'm sure you would like to enjoy such happiness, so I will share my much demanded recipe below. Put all ingredients except water into your Vitamix or blender. Add only 1/2 cup of water and blend on high. If using a Vitamix, use the included plunger to help it blend. If you're using a regular blender, you'll have to stop the blender and scrape the sides with a spoon or rubber spatula. Add more water if mixture is too thick. I like mine the consistency of a thick and creamy sauce or dressing. Enjoy! *Dried organic beet powder gives it an intense pink color, perfect for Valentine's Day! Don't use too much or it will give it too much of an earthy flavor. Just a pinch intensifies the color without changing the flavor. 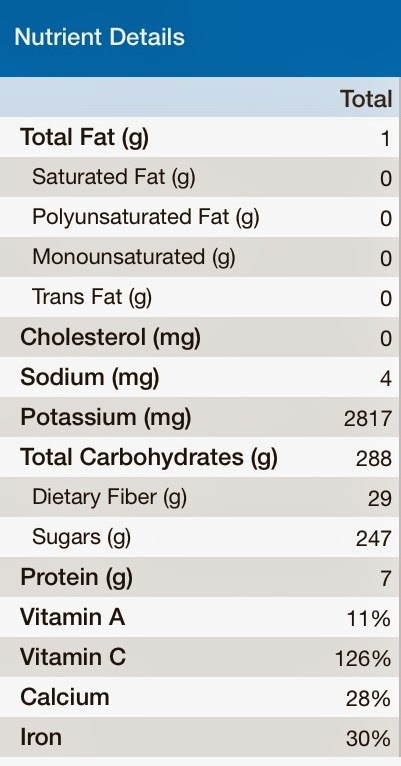 **Just fill the Vitamix half way to the top of the dates with water. If your dates are dry, then soak them for a few hours by covering them just enough with water. Then use that date water for the dip which will be sweeter than plain water. USE WITH CAUTION! If this recipe gets in the wrong hands, then rainbows, butterflies, and unicorns will take over the world! Full of healthy sugars and fiber, potassium, vitamins, and minerals! That's what we want in good food. We don't want lots of hard-to-digest fats and proteins or lots of water-retaining salt. Good, clean fruit is where it's at! 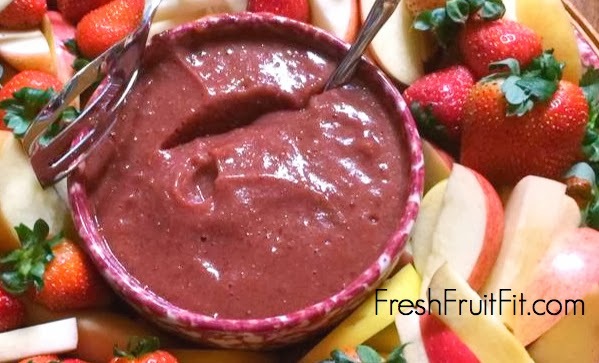 Add some more water, blend, and drink up a delicious smoothie! How does a healthy diet survive the changing seasons? Subscribe to get seasonal and satisfying recipes delivered straight to your inbox!